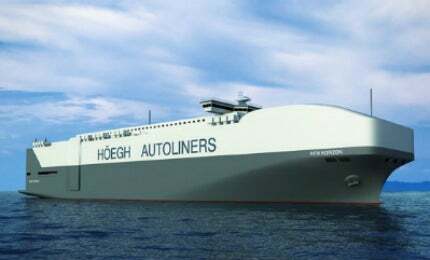 Höegh Autoliners ordered for the Horizon Pure Car and Truck Carrier from Xiamen Shipbuilding Industry in January 2013. The Horizon-class Post-Panamax type vessel has a capacity to carry 8,500 cars. The propeller blade for the 8500-CEU Horizon PCTC vessel was supplied by MAN Diesel & Turbo. Artist’s rendition of the New Horizon PCTC. Image courtesy of Höegh Autoliners. The steel cutting ceremony of New Horizon PCTC held in Xiamen Shipyard, China. Image courtesy of Xiamen Shipbuilding Industry Co.,Ltd. The new Horizon-class pure car and truck carriers (PCTC) are being built by Xiamen Shipbuilding Industry (XSI) in China for Norway-based firm Höegh Autoliners. The carriers are the world’s biggest automobile Ro-Ro vessels with a capacity to carry 8,500 car equivalent units (CEU). The post-panamax vessels can also be configured to carry both high and heavy project cargo. The first vessel, Höegh Target, was delivered in July 2015. Höegh Autoliners signed a contract with Xiamen Shipbuilding Industry for three PCTC vessels in January 2013. Construction of the first vessel, Höegh Target, began with a steel-cutting ceremony at the Chinese shipyard in October 2013. Keel was laid in April 2014 and the ship was delivered in July 2015. XSI received orders from Höegh Autoliners for three more vessels, bringing the total number of vessels to six. The deliveries are scheduled to finish by 2016. Aker Wayfarer is a sister ship of Skandi Aker, the largest monohull subsea well intervention vessel ever built. Ocean Yield, a wholly owned subsidiary of Aker, placed shipbuilding contracts with XSI for two 8,500 CEU car carriers. Höegh Autoliners signed a 12-year bareboat charter agreement with Ocean Yield for these vessels in September 2014. Finnish company Deltamarin designed the world’s highest-capacity PCTC vessel under a design contract with XSI. It is listed under the Norwegian International Ship (NIS) registry with DNV classification. New Horizon has an overall length of 199.9m and breadth of 36.5m. Its length between perpendiculars is 192m. The vessel operating draft is 9.35m and deadweight at maximum draft is approximately 15,150t. Its gross tonnage capacity is 20,800t and deck area is 61,800m2. The state-of-the art vehicle carrier features a liftable internal ramp system in a cargo hold layout with 14 cargo decks and five hoistable car decks. It is equipped with a stern ramp, which carries approximately 250t of cargo. The vessel also features another side ramp, which has a carrying capacity of 22t. The vessel provides accommodation for up to 23 crew members. It has a sea endurance of up to 30,000 sea miles and can sail at a maximum speed of 21kt. New Horizon features a double-hull construction to reduce pollution from fuel tanks and is fitted with an E-engine for reduced NOx and SOx emissions. "The state-of-the art vehicle carrier features a liftable internal ramp system in a cargo hold layout with 14 cargo decks and five hoistable car decks." The ship is ergonomically designed with an aerodynamically shaped bow section with an enhanced ventilation fan system for easy-maintenance and reduced wind-resistance. The vessels offer 15% more cargo carrying capacity than other ships with similar dimensions. Safety equipment aboard includes a safe access system and enclosed bridge wings. Additional features aboard the automobile carrier include a ballast water system and an oily water treatment system. MAN Diesel & Turbo signed a deal with XSI to supply Kappel propeller blade designs to the PCTC. The propellers save up to 6% of fuel compared with conventional propellers. The marine cargo handling and offshore solutions for the vessel are offered by Cargotec’s MacGREGOR business area.